I think this is the prayer of every parent’s heart. We parents feel the incredible responsibility of raising and nurturing another life. No responsible parent wants to fail at that task. One has to only investigate the parenting section of a bookstore to see that there is a significant demand for the answer to this question. Psychology has a whole branch devoted to investigating and researching child development to answer this question. Science is employed to discover the right methodology for raising our children to become well-adjusted adults. I suspect that every responsible parent has looked at the precious little life asleep in those dark hours with a sense of fear and self-doubt – “I don’t want to screw this up. What am I to do with this child”. It is the manufacturer’s operating manual that we seek. We want to be taught what to do with this child who has been given to us. The story of Samson encourages and discourages me. It reveals a reluctance in my heart to trust God. I want a guarantee; I want a standard operating procedure that will ensure the salvation of my child, if diligently followed. Unfortunately, the scriptures do not give such a guarantee. 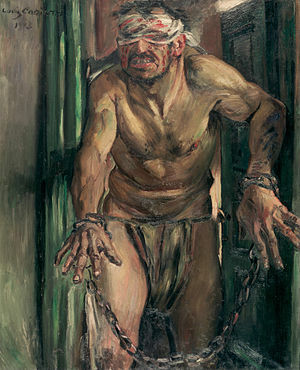 Samson came from a home of devoted and dedicated parents who believed the promises of God. Yet, Samson was far from a Godly man. So, what went wrong with Samson? What did his parents do wrong? Here is the hard part – probably nothing. I have heard some teach that Samson’s parents were too indulgent. They may have been. It is equally possible that his parents were not indulgent enough since they raised him as a Nazarite. I am not sure how being over-indulging and the requirements of a Nazarite vow go together. However, look at how easy it is to fall into the “methodology mindset”. If Samson’s parents had only followed the right method, then Samson would have turned out different. The problem with the methodology mindset is that we are missing a key ingredient – God. I don’t believe that God looks at Samson with a shrug and goes, “that is too bad; not what I really had planned but I guess it will have to do – if only Samson’s parents had done a better job.” I believe that Samson was clay in the master potter’s hand from his conception and that his life played out exactly as God had intended. Each and every person is responsible to God for the decisions that they make, there is nothing that we parents can do to program our children’s hearts to get the decisions that we want. Do the best I can and trust God. God is faithful and good. My kids’ faith is too precious for God to leave in my hands as a sinful parent. My kids are in the hands of their Creator; the hands of the Master Potter. The question for me is whether I trust him to mold them into what he has planned for them. God is good and he knows what he is doing. There is no need to fear. I think that I have the perfect gift idea for my wife – night-vision goggles. She really needs them. She has horrible night-vision. If we wait for her eyes to adjust to the dark, the sun will rise. Dim the lights and the everyday surfaces of our home become an obstacle course for her. I have gotten more good-night kisses on my nose, side of the mouth, or eye, followed by the “blindman’s” pat on the face, than I can count. The pat is usually followed by repeated attempts until she lands one reasonably square. It is sort of like “walking” artillery into its target. We get a lot of kissing done this way but it is not all that romantic – humorous but not romantic. Although, being kissed by a woman in night-vision goggles doesn’t seem that romantic, either. I may need to rethink my gift idea. That does not diminish my desire to have night-vision goggles for myself. I think it is the coolest thing to see in the dark. Who wouldn’t want that ability? I know that is why they make flashlights but night-vision is piercing the mysterious vein of darkness. That is just cool. However, what I really want is the ability to pierce through the darkness of life. The disciples were troubled and doubting what Jesus had said because they were not seeing clearly. They had hoped that Jesus had come to redeem Israel (vs. 21) but then he had been crucified. They were stumbling in the dark, trying to make sense of all the events going on around them. It took Jesus opening their eyes to the scriptures (vs. 31,45) for things to make sense; for the doubts to be answered and the troubles erased. Everyone requires that help. We all have stumbled through the darkness of this world. Groping around to make sense of the senseless; encountering truths that seem familiar – like we should know them – but just can’t figure out their relevance. The challenge for every person is that we are visually impaired. We don’t have the eyes to see clearly the truths of God that are all around us – in the world and in the scripture. It takes the Spirit of God to open our eyes to see clearly. 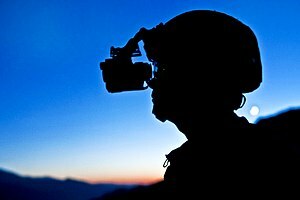 The Spirit of God is our night-vision goggles in a very troubled, confusing, doubting, and dark world. The Spirit has the power to turn night into day. It is why we need to daily put on the Spirit – we need to daily set our minds on the things of the Spirit. It is through the Spirit that we will see that the world is not out of control and there is nothing to be worried or troubled about. It is through the Spirit that all the questions of a doubting mind are answered. It is through the Spirit that our eyes are opened and we can have the joy and peace intended for a Child of God. Let’s put on the Spirit this day and every day. I competed in my first triathlon back in August. My goal was to finish in the top fifty of my age class. I finished 51st and was a little bummed. However, I was slight over 50% of the whole field so I was safely in the bell curve of the competition and, most importantly, I didn’t embarrass myself. I have never won a “real” race. I have never even placed in a real race. I don’t pursue the unrealistic goal of actually winning. My primary goal is to simply not embarrass myself. I don’t want to be that guy who pukes or soils himself. If I can finish in the meat of the bell curve, then I will be happy. I have never been the smartest person in a “real” class. I have always been the victim of the exceptional; those who would skew the class grading curve in a direction that I never found favorable. I was not valedictorian at my University, High School, Middle School, or Kindergarten, for that matter. My primary academic goal has been to pass the class and not embarrass myself. I have never been artistic. I am amazed by those who can create art. I am in awe of those who can move me to tears with music; who can paint vivid images with a palette of words; who can convey profound meaning in images. My attempts at “art” are shared within a very limited circle because I simply don’t want to embarrass myself. I continually ask people if what I am communicating “makes sense” to them because I have learned that everything that makes perfect sense within my mind does not always get communicated in a way that makes sense to anyone else and that is embarrassing. I am the meat of the bell curve and so are about 68% of you all. We are the meat of average. We are the ones that have not won the prizes, ribbons, scholarships, commendations, or honors. Therefore, it might seem daunting for the majority of us, who are so familiar with being the meat, when the Bible talks about competing for a prize. It is particularly daunting when the consequences of that race is eternal life. That is until we realize that our race is not an individual race. Our race is a team competition and our partner has already secured the victory. We have already won. There is no chance of being embarrassed. There is no chance of failure. We just need to endure to the end and finish. We just have to get across the line and the victory is ours. All the accolades will be for the one who actually earned the victory, as it should be. My inability to secure the prize on my own just amplifies his gloriousness. The other day I took my kids into the “big city” to finish up our Christmas shopping. I am a sucker for coffee table books so I had to linger in one store over a wonderful book on castles and fortresses. The photography was excellent and I was momentarily transported to a time of grandeur and pomp. I was nudged back to my warehouse reality by the bustling of the crowd and the urgency of youth to do anything but look at coffee table books. My mind returned to those castles on our drive home through the daze that Christmas shopping elicits. I contemplated the reality that those impressive structures of wealth and power had been someone’s home. They had been home to people of importance, influence, and maybe even reverence or fear. They were constructed as a statement about the owner. However, that statement is now lost because I do not know nor care about any of the owners. I wonder how long it took for their memories to fade. Each and every one of those “great” men, who built these structures of which I still marvel, had surrounded themselves with their pomp. Each and every one of them are gone; they have gone the way of every beast and perished. I wonder where they are now. Their pomp stripped away and assumed by another in an endless cycle. It is a cycle that reminds me of the roosters that we have had in our chicken coop. All our farm animals, roosters have pomp. They strut in all of their perceived chicken brilliance. They ruffle their colorful feathers. They perform the cockerel “waltz”. They stick out their chests and parade around their domain in complete pomp and circumstance. However, they have no understanding of where their food or water comes from. They are ignorant about how the concrete floor of their coop was built. They cannot appreciate the protection given to them every moment of every day by these entities only vaguely perceived on the periphery of their reality. They even have the audacity to challenge those who sustain them. They charge the ones who care for them, flapping their wings and extending their talons. They don’t understand the speed at which they can become the main ingredient in a casserole. They do not realize the brevity of their life. They do not realize that the value of their life is equivalent to a flavored latte. We have the tendency to live our lives more like these roosters than we may care to admit. We can surround ourselves with so much pomp and circumstance, completely unmindful of all the mysteries sustaining us. Most of the time we don’t even know the right questions to ask. I shock myself at how easily I can become consumed with the importance of my own “little coop”. I can strut around in my pomp – reveling in my self-perceived importance – offended by those who don’t esteem me as they should. I have even had the audacity of making demands of the One who sustains me. I have been disappointed that he has not cared for me according to my plan as if I understand the mysteries of the universe better than its architect and creator. This world is populated with those strutting along the path of foolish confidence insensible to the glorious mysteries all around them. As brilliant as any rooster may be, it is still a chicken. As brilliant as any man or woman may be, they are still human. No matter what great structure they build, no matter what achievements they may obtain, they are still created men. Man is mere man, but God is God. May we remember that the next time we are inclined to do a little strutting. May we humble ourselves and worship him for he is due all our praise. I remember a summer picnic from my youth. It was a very typical summer afternoon. Warm enough that you wanted to stay under the protection of the shade trees, with a slight breeze, blowing the freshness of the adjoining hay-field across the lawn. The BBQ filling the space with the aroma of cooking steaks; friends and family filling the ears with laughter – lots of laughter. However, this picnic sticks in my memory for the opposite of laughter. At this picnic, I took a stand with righteous indignation of passion. For in the midst of this particular gathering, an offense had occurred. A giant of a man, at least that is how I viewed him at the time, had uttered a grievous insult to my Dad. He had called my Dad a “so-n-so”! To this day, I cannot remember what he actually called him. I realize now that what I had perceived as an insult was merely a joke common among adult men and rarely appreciated among women and children. The response that I received was not what I expected. I had expected to be crushed but what I got was a smile with a pat on the head and a “You’re right, he is not”, in a voice of complete understanding and condescension. I realized in a flash that my Dad had not needed me to contend for him. It occurs to me that many are going about roaring at any slight or offense to our God as if he cannot contend for himself. We forget that God doesn’t need anyone to contend for him. He is God. The thought of God needing us to contend for Him is more amusing than my adolescent contending on behalf of my Dad. Any god that needs man to contend for him is not God. We can become so consumed with contending for God that all we become known for is what we are against. We should be known for what we are for. We should be known for our love and compassion for one another; we should be known by our good works. I see many Christians out in the public square and they seem angry and contentious. That may be a sign that their attitude has slipped into the realm of contending for God. I don’t know where that line is. I believe that we need to speak up in the public squares of the world for truth. However, we should always remember why we are doing it. Our job is to boldly proclaim the gospel to all who will hear. It is not to be right about moral issues. It is not even to protect a lifestyle that we believe is preferable, even Biblical. As Christians, we are for the good news of Jesus Christ. We are for taking care of the widows and orphans and those who are in need. We are for speaking the truth in love so that the lost may be saved. We are to love our enemies and do good to those who hate us, bless those who curse us, and pray for those who abuse us. We are not to contend with them. That is God’s job. Jesus did not come to protect the righteousness of the law. He came to fulfill it. He came to save those who are lost. We are to search the world for those who are not offended by Christ. That means we are going to find a lot of folks who are offended by Christ. They are not our goal. We are to preach the gospel in love to a world where the majority will not appreciate us. They will revile and insult us. They will do and speak many things that we don’t agree with. Let us respond as Christ responded – in love – and leave the contending to God. The question of “why” is as natural as breathing. Gideon asked “why” his family and relatives were being regularly devastated by a foreign people. In the same manner, people along the East Coast have asked “why” their homes and communities were ravaged by storms; People across the world ask “why” would a person murder so many innocent adults and children in Connecticut and China. Tragedies usually result in a quest for the answer to “why”. God answered Israel’s cries of “why” by sending them a prophet. That response may seem completely inadequate in the face of a real threat. However, it is only inadequate when one does not consider the mercy that God shows us by giving us a life of peace and prosperity. The personal tragedies experienced each year by the families in Israel were not the result of the weakness of their political system. Their real problem required a prophet because their problem was spiritual. God gave an answer to Gideon’s question of “why”. Gideon’s country, community, and family were following false gods. Gideon’s own father had an altar to Baal in their backyard. The answer to “why” was very close, very real, with very real consequences. Gideon had the appropriate response to the “why” of his tragedy – cut down the altar. 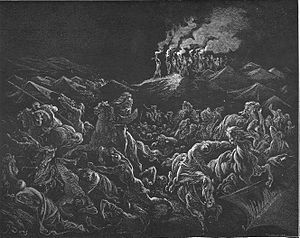 It was then that the Lord could use Gideon and his country-men to stop the tragedy of the Midianites. How are we going to respond to the tragedies of our time? Why is all this happening to us? The answer to that question is not across the country. It is not in laws. It is not in funding mental health programs. It is not in education. The answer to “why” is in my backyard and your backyard. Many people feel powerless in response to the tragedies. We need to realize that we all play a part. We have the Word of God and it is calling us with the same message as to Gideon – cut down the altars in your own backyard. That is what we can do. Don’t look for someone else to do something. We need to start with ourselves. It is when we respond to tragedies by getting our own lives and homes in order that we will be prepared to be used by God. May these tragedies result in us examining what we worship and turning in obedience to the one who is calling us – God. I took my daughter and her friend bowling yesterday. It was bowling without consequences. They were bowling with bumpers. 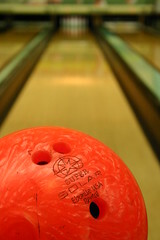 Bowling bumpers are metal barriers raised in the gutters to keep the bowling ball in the lane. The result was that pins fell on every try. That is not very realistic given the bowling skills of these two young ladies.The girls made great use of the bumpers as they bowled. Rather than bowling as if the bumpers were not there, they incorporated the bumpers into their game. The bumpers are supposed to be a safety net. However, they were bouncing the ball between the bumpers and turned their lane into a form of a pin-ball game. They were playing a game but it was not really bowling. Does God give us bumpers to our spiritual lives? I know some folks who live their lives like one misstep will send them head long into the gutter of destruction. I know other folks who live like there are no gutters and go bouncing down the lane of life without a care or concern for the consequences of their actions – like there are none. There is no easy answer to this question because I think that it is “yes” and “no”. The answer depends upon how the question is defined. If we consider that falling into the gutter of life is the loss of one’s salvation, then I believe that God has given us bumpers. I believe in the eternal security of the children of God. However, the manner in which you live reveals whether you are actually participating in the right game. I am concerned for anyone that lives smashed against the bumper or bouncing between the two sides as if they are trying to get out of the lane. Those who are called by God will desire to go down the center of the lane; periodically we may stray off course but we should not want to be up against the bumper. Those who purposefully seek to get out of the lane should be concerned because I don’t think that they are playing the game that they think they are – I don’t think that they are saved. Those who love Jesus will desire to keep his commandments – they will desire to be in the center of the lane. If you don’t – then your love for Christ has to be questioned – if you don’t value Christ as a treasure then you may not really know him personally. The other way this question is viewed is that God will keep us out of the gutter of bad consequences. I believe that the answer to this is absolutely “no.” Falling into the gutter of bad consequences is often how God teaches us some very important lessons. My daughter did not focus on improving her bowling because there were bumpers. There was no need for her to heed the warnings of the gutter because there was no way for her ball to fall into it. My guess is that she and her friend would have focused more on how they threw their balls if there were gutters. God has given us many warnings to watch ourselves. If it was impossible for us to fall into dissipation or drunkenness or the cares of life or all his other warnings, then why would he tell us to watch ourselves or examine ourselves? I believe that he tell us that because it is possible. We have the opportunity in life to learn the easy way or the hard way – God loves us so he is going to make sure that we learn and grow – how depends on whether we live like there are bumpers or not.